Earlier this summer, I decided to take on a small DIY project. I am not a big DIY-er…I can’t seem to make things turn out just right…and I am finally comfortable in my own skin about this fact. However, I can do simple things like paint. For over twelve years, we have had a plain, white front door. Being a mix-things-up kind of girl, I did a Google search for painted door colors that go well with red brick houses. The top two most popular hits came back with the colors turquoise and yellow. Since I already have so many turquoise accents on my front porch, I opted for yellow. 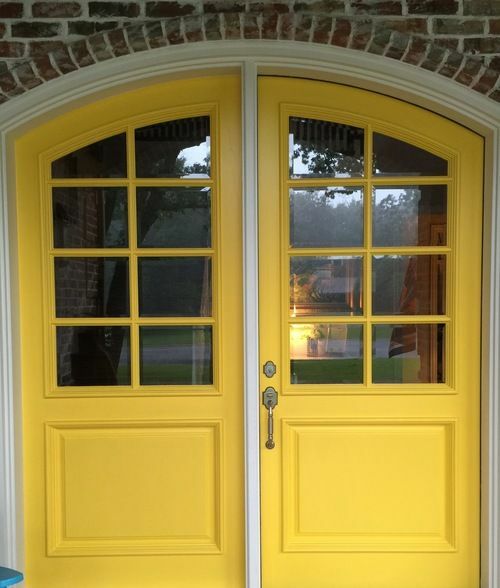 I found paint specifically for doors in a bright shade of yellow. The name of the color, “Happy.” Of course. The paint took a little while to arrive, and I had to find just the right day to paint. I started out by prepping the door (i.e. washing away all the little gnats and spider webs that like to accumulate) and taping the windows (multi-pane glass looks pretty, but it is not so easy to prep). Right before the first paintbrush full of yellow paint when on, I kind of held my breath. What if it was like really bright? What if I don’t like the color? 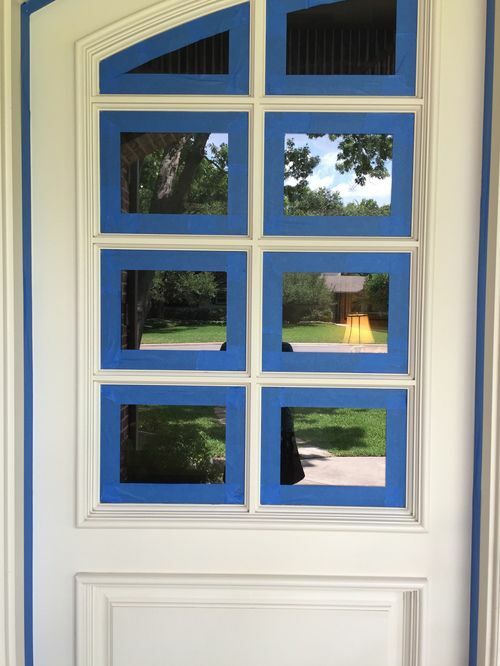 There were no test swatches in my plan, and I was quite sure I didn’t have the paint anymore for the front door in case I changed my mind. It was an all or nothing kind-of-thing. If you’ve painted at all, you know how painting can lull you into thinking…at least it does for me. As I brushed the door, the thoughts of, “Why do you want to paint the door yellow?” and “What does this yellow mean?” popped into my head. My first thought, I want the door to make people smile. My second thought, I want people to think we are joyful, full of life, welcoming and loving. Can a front door really say all of this? As I painted the door that day, I wondered Is there a spiritual side to this door painting thing or the color I’ve chosen? I wrestled with that for a few hours, and just as I was finishing up the painting, clouds rolled in, and a light rain began to fall. 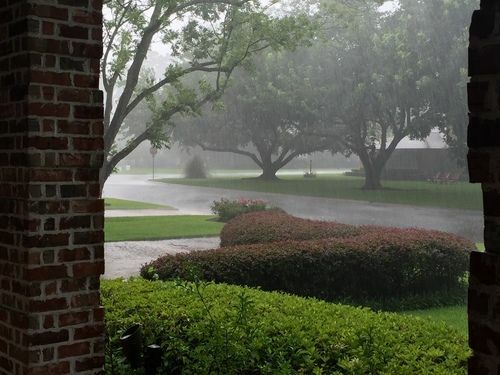 By the time I got the blue tape off the front door and cleaned up, the light rain turned into a deluge—completely out of nowhere. It was so surreal I even took pictures of the storm. No matter how we look on the outside, there is a struggle going on in the darkness. Pain exists behind front doors, and behind the smiles on our faces. If we are not careful, darkness can, and will, extinguish the light. To make sure our insides are thoroughly grounded—no matter the conditions we are facing—our foundations and fundamentals must be completely lined up with the will of God. Because eventually, exteriors will chip and grow dim, and begin to expose cracks. But if we continually place ourselves in the presence of God, our exteriors, and our hearts will both reflect the glory of His presence. My prayer is that my life always reflects the goodness of God’s glory. That when people think of me, they think of Jesus by the way I live and act toward others. 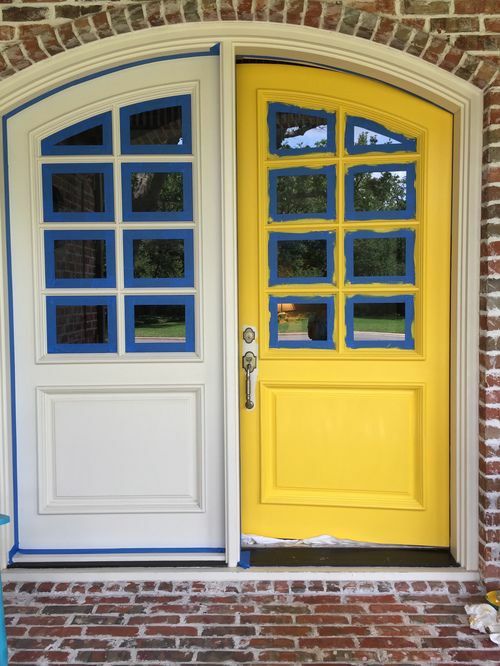 Just as much as I want my yellow front door to make people smile, bring someone joy, and be inviting to neighbors, I want my legacy to be that, as well.